Setting the Stage: The combination of YOB, Voivod, and Amenra under one bill promised a night of salvation through heavy metal, and there was an air of positivity and warmth on Thursday (April 4th) inside Brooklyn’s Warsaw. Though each band is sonically forceful in terms of sheer volume, these bands share a holistic trait of approaching metal as a means of emotional release and contemplation. YOB’s music is that of personal reflection and the search for peace inside oneself, guitarist and vocalist Mike Scheidt assuming a shamanistic figure in the metal community; Canadian vets Voivod refract the horror of techno-futurism through joyous prog-thrash as a sort of sci-fi commentary; and Belgium’s Amenra literally treat their performances as rituals, having formed their own collective, the Church of Ra, for likeminded artists. This wasn’t just bands playing on a stage. It was a quest for the spiritual. Taking the Stage: Amenra began 15 minutes before the advertised show time, a recurring issue at Warsaw (which has a hard midnight curfew). The room would gradually fill as the band ran through lengthy meditations from their latest record, Mass VI. Their music recalls the cathartic brutality of Neurosis filtered through the compositional spaciousness of post-rock, pastoral passages of minimalist guitar contrasted against moments of massive sludge and doom. Stark black and white images of empty fields played behind the band, who were illumined only by the screen behind them. They appeared as moving shadows, formless silhouettes — vocalist Colin H. Van Eeckhout being the emotional and theatrical centerpiece. With his back to the audience, he danced and shadowboxed, contorting his limbs and body to the cadence of the music, as if he was trying to swim through the air. In the past, Eeckhout has taken Amenra’s ritualism to physical extremes that verge on live installation art, including scarification and pain endurance performances in which heavy stones were hung from meat hooks pierced through his skin and another during which he was suspended Christ-like above the stage. 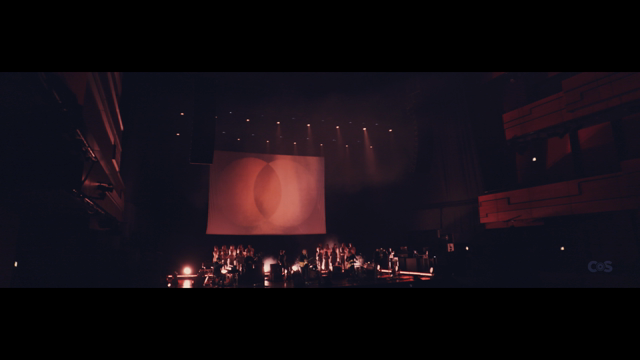 It stands as a testament to his conviction to his art and Amenra’s search for something deeper through live performance. Though Eeckhout shed no blood on this night, the music served as a transportive vehicle for his passion. By comparison, Voivod’s set was downright giddy. Frontman Snake was all smiles and laughter, wagging his tongue and commanding the stage with charisma and enthusiasm. Formed in Canada in 1982, Voivod are a metal institution that have seen many eras, iterations, and band members, but their current lineup is among the best, having release 2013’s Target Earth and The Wake last year, each to warm receptions. Tracks from the latter (“Obsolete Beings”, “Iconspiracy”) sounded just as fresh and invigorating as cuts from their classic albums like “Into My Hypercube” (Nothingface) and “The Prow” (Angel Rat). The band was in noticeably good spirits, often hugging and exchanging toothy grins with one another during breakdowns and solos. Drummer Away — Voivod’s only consistent member since the beginning — played with speed and vitality, holding steady through the winding progressive metal arrangements of the band’s new material and thrashing out with wild abandon on old-school cuts like “Ravenous Medicine” from their punkier ’80s era. His classic sci-fi sketches of hellish future centurions and metallian tanks, many used as Voivod artwork, were projected behind him. Before the final song, Snake took a moment to acknowledge the band’s founding member and guitarist Piggy, who died in 2005. “Pig-gy! Pig-gy!” the crowd chanted as the band launched into the self-titled “Voivod” to close the set. When YOB appeared onstage before the packed crowd, it was triumphant and affirming on multiple levels. The band is a DIY success story, working up from humble origins in the Northwest metal scene, where for years they could be seen playing house shows and bars across Oregon and Washington state. Over that span, they released a consistent string of emotional doom albums, culminating with the acclaimed Clearing the Path to Ascend from 2014 and last year’s Our Raw Heart, the latter coming in at No. 1 on our Top 25 Metal + Hard Rock Albums of 2018. These records brought the band the exposure they deserved, and now they were playing to a near sold-out Brooklyn crowd. It was also during that span that Scheidt was diagnosed with a painful intestinal disease, literally fighting for his life after a severe attack of severe diverticulitis hospitalized him in January 2017. Undergoing multiple surgeries and pain so intense it triggered hallucinations, Scheidt emerged from his near-death experience through philosophy and Buddhist meditation exercises. To see him onstage again with his band was invigorating and inspiring. There is a calming, zen-like quality to YOB’s music. “Prepare the Ground” and “Ablaze” are structured around the repetition of Scheidt’s hypnotic, circular riffs. The band locks in around a central theme or musical passage; meanwhile, the audience nods in time. Stretch this out for 10 minutes, and the room is suddenly clinging to every note, every variation on that theme or riff. YOB fully realized this effect, captivating the audience not with visuals (a singular Buddhist image was displayed), but with the power of repetition, timely variation, and the airtight rhythm section of drummer Travis Foster and bassist Aaron Rieseberg. “The Lie That Is Sin”, centerpiece of The Great Cessation, was a highlight from the set, eschewing the approach of the first two songs with jagged avant-garde turnarounds and loud-soft dynamics. Scheidt’s vocals were equally as expansive, spanning the range from operatic tenor to guttural growl. His singing was on point all night, always hitting that seemingly impossible high note in each song. YOB are a band that intends to explore every human emotion unconditionally, no better epitomized than by post-metal opus “Marrow”. This immersive, melodic piece of slow metal blossomed as the band gradually built up to its climatic, tear-jerking conclusion. It is the definition of heavy music as comfort, a sweeping epic beautifully rendered in the live setting, where there is no filter between art and artist — where a band can literally lose themselves in the music alongside their audience. When YOB finished playing, it was if they suddenly awoke and realized there was a crowd. Scheidt bid farewell to the crowd and hoisted both fists in the air in well-deserved triumph.